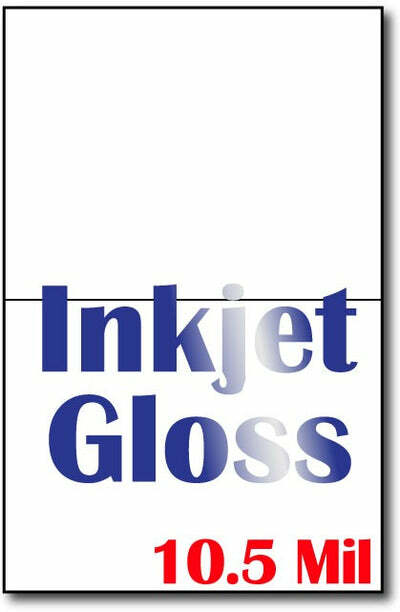 10.5 Mil Inkjet Gloss 4 1/4" x 5 1/2" Single fold-over greeting cards make great greeting cards for holidays as well as fun invitations for your next party! These cards come unfolded, measuring 8 1/2" x 5 1/2". There is a score in the center of the paper for easy folding. When folded, cards measure 4 1/4" x 5 1/2". Made from a 10.5 Mil (230 gsm) Inkjet Glossy cover stock. This paper is a single sided gloss and is only inkjet compatible. Please Note: Our Inkjet Paper is not compatible with Kodak Photo Printers.